Marathon season is well and truly upon us with the club producing some strong performances in Manchester and Omagh, while there was plenty of representation over shorter distances in Belfast and Whitehead. Marathon season is well and truly upon us with one of the biggest, the Greater Manchester Marathon, taking place on Sunday. 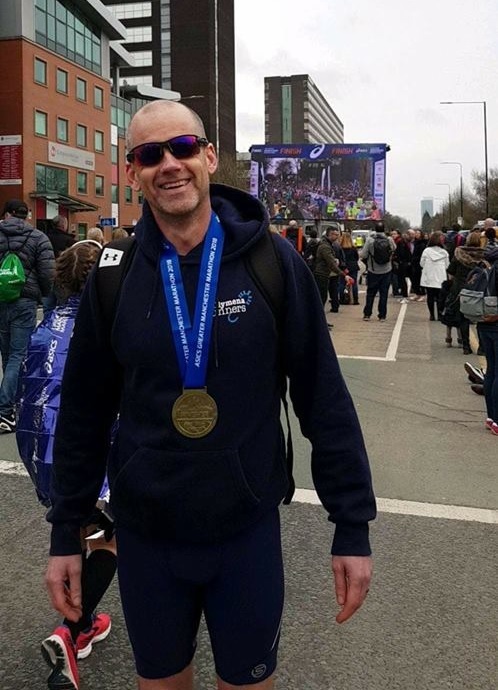 Billed as the UK's flattest, fastest and friendliest marathon over 13,000 athletes took to the streets of the city to run the 26.2 miles to the finish at Emirates Old Trafford, home of Lancashire Cricket Club. Of the Ballymena Runners in action John Robinson was first home in an amazing sub-3 time of 2:55:47, having to dig deep from 18 miles onwards in the clammy heat. John McGerty crossed the line in 3:44:41, and as if running a marathon wasn't difficult enough John donned a clown costume for the day! Meanwhile, Claire Martin completed yet another marathon, recording a time of 4:11:46 with an average of 9:31 per mile but there wasn't such good news for Jonny Graham who, unfortunately, had to withdraw through injury with over 19 miles under his belt. A 20-strong squad from Ballymena Runners travelled to Co. Tyrone on Saturday morning for the 29th edition of the Omagh Half Marathon. Jack McKenna was first to finish the 13.1 mile course, taking 86th spot overall in 1:26:42 followed by Joseph McDermott (140; 1:29:48) and Conor Crilly (177th; 1:32:02). And also deserving of their hard earned bling were Heather Birrell (2:16:35), Thomas Bradley (1:34:56), Adrian Dodds (2:31:41), Thomas Fee (2:06:03), Terry Foley (2:15:17), Kathryn Grant (1:55:57), Declan Hassan (1:37:39), Aine Hasson (1:49:20), John Hasson (1:48:41), Danny Jamieson (2:11:04), Sandy McDermott (1:50:36), Lynsey McKeown (2:31:43), Helen Metrustry (2:04:12), Paddy Millar (2:00:14), Wendy Moore (2:14:12), Brigid Quinn (2:15:45) and Elle Forrest Reid (1:39:06). The latest in the Novosco Grand Prix series took place on Sunday when over 930 runners showed up in East Belfast for the Titanic Quarter 10k. Ballymena Runners produced their usual strong representation at the race with Connor Reid the first to cross the line in club colours in 36:07 to take 28th spot overall. He was followed just a couple of minutes later by Eamonn Loughran (59th; 38:30) and Nigel McClintock (63rd; 38:49). 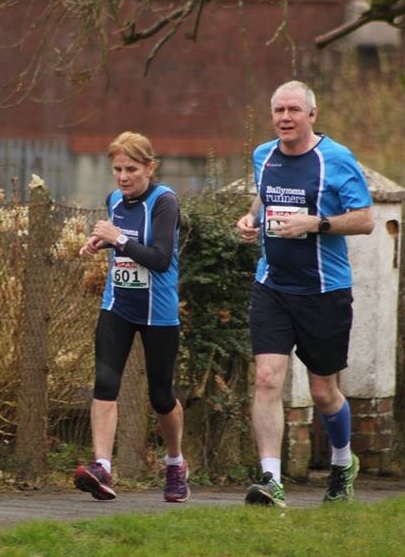 And other dozen from the club also ran in the unexpectedly warm conditions, namely Nigel Bonar (48:20), Hall Booth (42:53), Adrian Dodds (1:03:04), Lynsey Gordon (57:39), Martin Harris (1:14:54), Alistair Hill (44:46), Sarah McConaghie (58:19), Gerry McLaughlin (53:05) and Roy White (52:44). A special mention for Adrian Dodds who only 24-hours earlier had competed in the Omagh Half Marathon to clock up two races in as many days! On Easter Monday just over 200 hardy souls braved the wet, windy and cold conditions to conquer the 94th annual Whitehead 5-mile Road Race. The event was won by local man Mark McKinstry, representing North Belfast Harriers, but there was also a strong showing from Ballymena Runners with a number of athletes from the club producing strong performances, amongst them John Neeson (39:23), Geoff McClean (43:34) and Brigid Quinn (48:16). John McGerty wasn't clowning around in Manchester! John Robinson - sub-3 in Manchester!